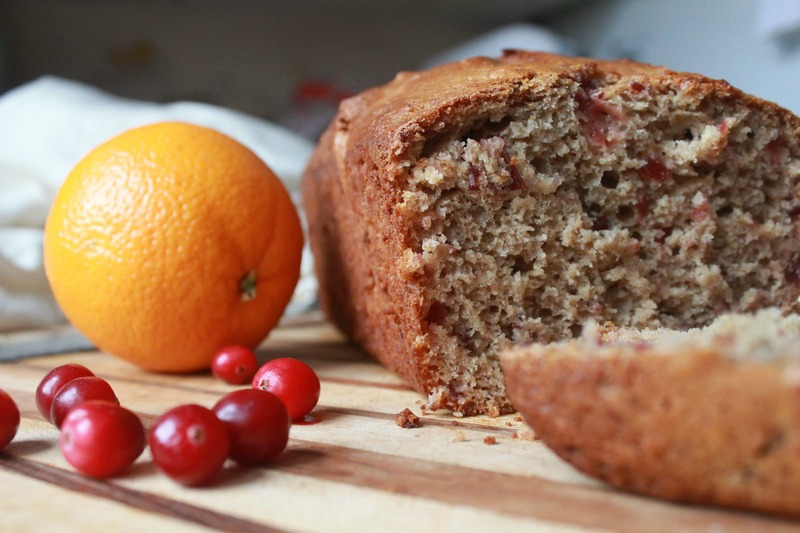 This recipe for Cranberry Orange Bread is amazing! So moist and delicious, it’s full of good ingredients. Put together this simple recipe in no time. When the weather turns cold, we start to crave an old family favorite. Cranberry Orange Bread! It’s the perfect mix of spice, sweet, and just a bit of tartness. If you haven’t tried it, you’re missing out. The best thing about a quick bread is that it’s just that…quick. The ingredients are pretty simple, definitely affordable, and it comes together in a snap. The hardest part is smelling it bake while you wait to sink your teeth in! Like most quick breads, you’ll simply mix up your dry ingredients. Then mix up your wet ingredients. And then mix them together just until everything is incorporated. When you pick up your cranberries, be sure you grab “whole berries” and not the jellied stuff your kids love (well, if they’re anything like mine!). A sure thing to love about this recipe is that you use up the whole orange. No need for waste! It reminds me of the story Dave Ramsey tells of the women who fought over the last orange. Finally, someone suggested that they just cut it in half. The first woman went home and ate her orange but threw away the peel. The second woman went home and used the peel in marmalade, but threw away the flesh. I think the moral is about communication. But I’d say there’s something to be learned about waste, too. I love the mix of cranberry and orange. Colors, I mean. The flavors are, of course, amazing! This Cranberry Orange Bread is so easy to throw together! Get a flavorful and succulent loaf from this recipe and enjoy the full flavors of winter. Preheat oven to 350. Spray or grease your bread loaf pan. In one large bowl, combine the dry ingredients. (Flour, sugar, baking powder, baking soda, salt, and cinnamon.) Set aside. In another bowl, combine the remaining wet ingredients. Mix well. Combine the wet ingredients with the dry ingredients. Mix just until incorporated. Bake for 50-60 minutes or until a toothpick comes out clean. Make a batch of Amazing Cranberry Orange Bread for work, for a potluck, or just for breakfast tomorrow! If you like make ahead foods, you’ll want to try this delicious Apple Cinnamon French Toast Casserole next. What’s your favorite quick bread flavor? This recipe for Cranberry Orange Bread is amazing! So moist and delicious, it's full of good ingredients. Put together this simple recipe in no time. I love Cranberry Orange bread. Dunkin Donuts used to make a cranberry orange muffin that I absolutely loved!!! I wish they still made it! I love this recipe! But, I was wondering…I don’t have cranberry sauce BUT do have fresh cranberries. Any thoughts on how to substitute them instead? You could make a sauce by cooking the cranberries over medium heat. Sprinkle well with sugar and add a tablespoon of cornstarch to thicken the sauce. Cook it until you get a nice, thick jam to use. Finding a use for those leftovers is the BEST! I just love the cranberry orange flavor combination. I have to try this recipe. Thanks for the inspiration! I love banana bread, pumpkin chocolate chip bread, zucchini bread and/or cranberry cheese bread. All so yummy and at least somewhat healthy.